The Marple Library, located in the Memorial Park, occupies two floors and adds to the many benefits available to residents and visitors alike. In addition to having approximately 40,000 books available, it has Exhibition and Meeting Room facilities, Study Room and Reference Sections, including Local History. Approximately 5,000 of Marple's 7,000 acres are included in the Greater Manchester Green Belt. The District is served by two railway stations, Marple and Rose Hill, which give the visitor and resident ease of access to most parts of the North West. The District also has a good bus transport service, provided by Greater Manchester Transport. The former rail link between Macclesfield, Bollington and Marple, closed in 1970 , is now converted to an attractive footpath and bridleway know as The Middlewood Way. The River Goyt flows though the District from south to north, meeting its tributary the River Etherow at a point near Compstall, appropriately named "Water Meetings". It then flows down through Marple Dale and on towards Stockport where it becomes the River Mersey at its confluence with the river Tame under the M60 at Portwood. Manchester Canoe Club, founded in 1933, have their own site on the River Goyt in Marple and regularly hold slalom competitions and river races there. For more details, visit the Manchester Canoe Club site. The Peak Forest Canal meets the Macclesfield Canal in Marple and with a flight of 16 locks, the second steepest in the country, and a 300ft wide aqueduct provide the main attraction and define the character of the town. Follow this link for more details of the Rivers and Canals. Marple is lucky to have two brass bands of its own - The Marple Band and Hawk Green Band (once known as Marple B Band) who are both proud to represent Marple and its environs. Sadly, The Marple Band is no longer in the Championship section - it is the way of brass banding that fortunes go up and down - but, although not contesting, is still rehearsing and playing and who knows what the future will bring. Hawk Green Band is in the Third section. Both bands regularly play in and around Marple, sometimes separately and sometimes as a joint band - for example in the carnival procession, at the Methodist Church, at Chadkirk and in the local pubs and shopping precinct at Christmas. Roman Lakes, Marple Library & Lock 10 - Mark Whittaker. 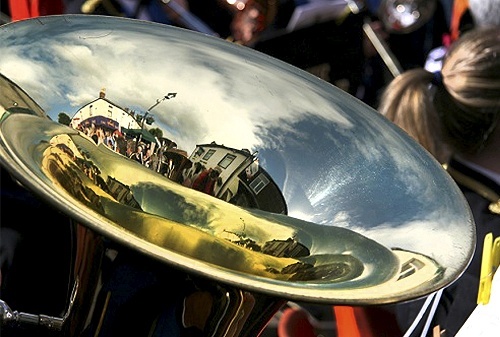 Brass Reflections - David Burridge (winning photo in 2010 Marple Festival Photography Competition).